Railroads helped build America in the last half of the 19th Century with the development of passenger and freight service. Indianapolis became a mega hub for passenger service in the early 1900's. The railroads played a huge role in the efforts of World Wars I & II in the movement of troops and goods. President Eisenhower started the interstate highway systems in the 1950's. The airlines came into their own in the 1960's handling people and overnight freight. Asian and European countries in the last 20 years have developed passenger trains that travel in excess of 200 MPH. President Lincoln in the 1860's had a vision for railroads. This is the era that railroads started to come into their own. However, since then the railroads have been on their own, except for a boost in the 1890's and during the World War periods. Amtrak started the Acela run between Washington, DC and New York City with trains capable of 150 MPH, but because of an aging infrastructure (over 100 years old) and tunnel system the Acela is mostly limited to 125 MPH on a dedicated right of way. Later service was expanded to Boston, MA. The average speed of the Acela trains is 83.4 MPH. The Midwest Regional Rail Initiative has set its sights on a 3,000 mile network connecting cities in nine states mostly at 110 MPH, which is a big improvement over the existing service. Service is being upgraded from Chicago to St. Louis. Also, service from Chicago to Detroit is being developed. The states of Indiana, Illinois, Michigan and Missouri along with the City of Chicago are working together along with the federal government to make this happen. These are steps in the right direction. Unfortunately there are many road blocks. In order to have a successful system, volume of traffic and frequency of service are critical. In addition, with the continued increase in freight traffic, passenger service not only needs to be competitive with the automobile on intercity routes, but also with airlines. Also there is a potential conflict between speeds of freight train versus passenger train movement when both types share the same corridor. In order to have frequency of service, a solution must be found that works for the freight rail lines and yet allows passenger service to meet schedules. The city of Chicago wants high speed rail from downtown Chicago to O'Hare Airport. Chicago downtown is also in need of a rail link around downtown Chicago. A new circulating system around downtown Chicago serving Metra and intercity rail, the museums, Soldier Field and McCormick Place, as well as the South Shore and former Illinois Central stations, Navy Pier and Merchandise Mart, hotels, theatres, and many businesses all around the outside corridor would be a great connecting circulation link for the downtown area. The commuter service on Metra from Union Station, Ogilvie Transportation Center and LaSalle Street Station is running close to capacity. If we were to add hourly service from downtown Chicago to Cleveland, Cincinnati, St Louis, Minneapolis-St. Paul and Detroit, there would be at least an additional 30 trains per day. If we also factor in the growth in additional freight traffic, there could be rail gridlock. Since the federal government's resources are constrained, along with those of most states, it would be very difficult to expect federal and state governments to provide major funding for the many miles of 110 mph higher speed rail throughout the Midwest Regional Rail Initiative. My point is that another alternative, more cost-effective system needs to be added to the current options in order to reduce congestion and improve the flow of people and material between major population centers as well as the circulation patterns within them. When I attended a conference at Purdue University several years ago, they said it was time to come up with a new system to move people in and out of congested areas. The government has a limited amount of resources to deal with this problem. As earlier mentioned, the states involved and the federal government and the City of Chicago must collectively work together to develop a new system that will help reduce auto and truck congestion on the highway and reduce the short haul air traffic and replace these with a more efficient system of moving passengers and container freight on the ground. Developing 110 MPH corridors on rails is a good idea for the present and is competitive with highway traffic, provided that the rail lines are not congested. But for the long term, it seems critical to me to develop a new 1300 mile alternative system serving corridors between Chicago and Cincinnati, Cleveland, Minneapolis-St Paul and St Louis, Missouri - a system that would complete an intercity network competitive with airlines - serving both people and container freight. This alternative to the high speed rail system could operate at speeds in excess of 200 MPH for movement of people. Container freight would move at slower speeds between rail yards and trucking company sidings to be delivered locally or directly into customer facilities. And what might this alternative system be that can link everything together? MONORAIL!!!! What can Monorail do? It can operate on abandoned or operating rail right of ways, highways, interstates and waterways. It can operate at speeds in excess of 200 MPH. Monorail operates mainly 40 feet off the ground. There is no freight interference; no problem with auto accidents or people being hit; and it has a remarkable record in Wuppertal, Germany. 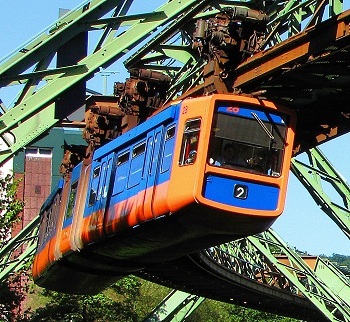 This monorail system has been operating there since 1901 with only one bad accident, and it handles 85,000 people per day covering a distance of 13.3 kilometers. Monorail can handle both passenger and container freight traffic and it can make a profit. Private money, with help and cooperation from local, county, state and federal governments, will go a long way in easing congestion and creating thousands of construction and permanent jobs. Furthermore, this monorail system can be designed to operate on solar and wind power with electric back up. Now is the time to expand and modernize our transportation system in the Great Lakes and Midwest Region of America. The Indiana High Speed Rail Association-together with other Midwest Regional Rail Initiative supporters and other organizations- has worked very hard to get to where we are today. We need to continue to move forward into the 21st Century. Monorail image via Wikimedia Commons.